This is a country of vast open landscapes, deep blue skies and scenic beauty. It is one of the largest countries in Africa, but with only a small population, there are large areas of true wilderness and complete solitude. After flying into Windhoek, an old German colonial town, the easiest way to explore is by a combination of self-drive and small scenic flights. There is a variety of accommodation, mobile camping safaris, luxury lodges and small tented camps that all blend carefully with the surrounding scenery. 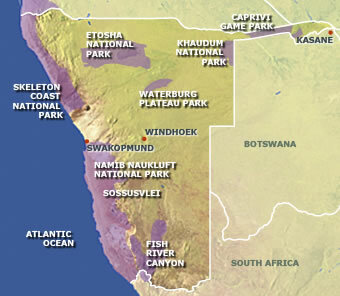 Starting in the far South you will find Fish River Canyon, second only to the Grand Canyon in scale. The river twists and turns through steep and winding gorges and is best viewed from the air in order to realise the magnitude of this natural phenomenon. Just to the north of this is the famous Namib Naukluft National Park with its immense red sand dunes that tumble down into the Atlantic Ocean. 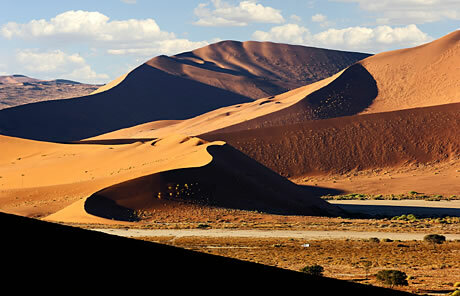 The most visited area is Sossusvlei where a dawn climb to the top of one of these dunes rewards you with a sunrise you will never forget as the sea of sand reflects the glorious crimsons and oranges of the morning light. Swakopmund, with its German architecture and misty morning fog that rolls in off the Atlantic is a great place to explore after the heat of the desert. Here you can visit Cape Cross, famous for its seal colonies and go kayaking with these charming and playful animals, or for the more adventurous there is dune boarding and quad-biking amongst the rolling dunes. Further North is the Skeleton Coast, inaccessible to vehicles, but fly-in safaris allow you to see the remains of early explorer’s ships pushed in by the treacherous tides, bleached bones of whales and flocks of pelicans and flamingos. 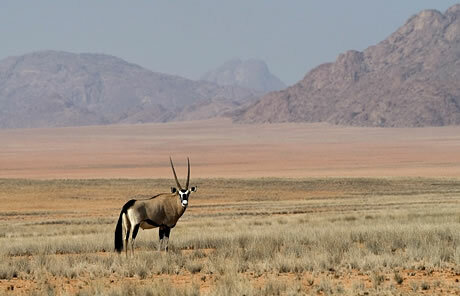 Inland you find the lunar landscapes of Damaraland, home to desert-adapted elephants, black rhino and Hartmann’s zebra. And finally we come to Etosha, one of Africa’s largest game parks. The main feature of this park is the Etosha Pan, a vast shallow depression that glitters and shimmers in the heat. Scattered round the edges there are permanent water-holes that attract a huge number of game. 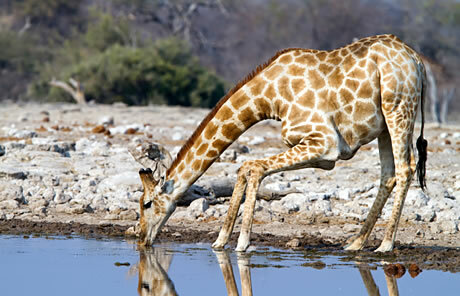 Giraffe rub shoulders with white and black rhino, 100 strong elephant herds amble across the open plains and the herds of grazers are under the ever watchful eye of lion, cheetah and leopard. The park has just three basic rest camps but just outside you will find a selection of lodges and private camps that offer some serious luxury. 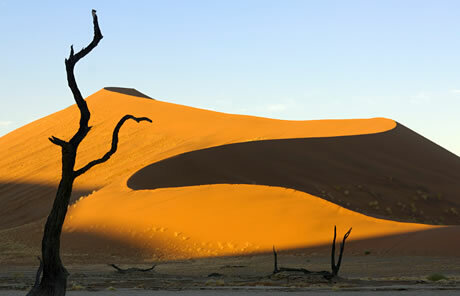 This two week itinerary is a perfect introduction to Namibia as it visits all the main highlights. Transport is a combination of self-drive and internal flights and the accommodation has been selected to give you a flavour of what this beautiful country has to offer. Day 1: Depart UK for an overnight flight to Windhoek. Day 2: Arrive into Windhoek and collect your car. Overnight at the Olive Grove Guesthouse. Day 3-4: Drive up through the rolling hills and wide valleys of the Central Highlands to the Waterberg Plateau. 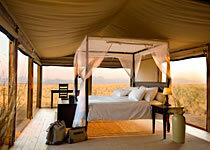 Spend 2 nights at Okonjima Camp, home to the AfriCat Foundation. Day 5-6: Continue up to Eastern Etosha where you are based for two nights at Mushara Bush Camp, the perfect place to explore Etosha National Park for yourselves. Day 7: Drive round to the Southern border of Etosha for 1 night at Anderssons Camp. Day 8-9: Drive out across the rugged landscape of Damaraland for two nights at Etendeka Camp which is renowned for its remote location and excellent guides. Day 10-11: Heading down to the Erongo Mountains you now have two nights at the fabulous Erongo Wilderness Camp where there is excellent trekking. Day 12: Arrive in Swakopmund on the Skeleton Coast for an overnight stay. Day 13-14: Drop off the car and fly internally over the red dunes of the Namibrand Reserve in the South West, for 2 nights at Wolwedans Dunes Lodge, a luxurious camp built on top of the dunes. Day 15: Fly back up to Windhoek for a final night at Olive Grove. Day 16: Flight back to the UK. 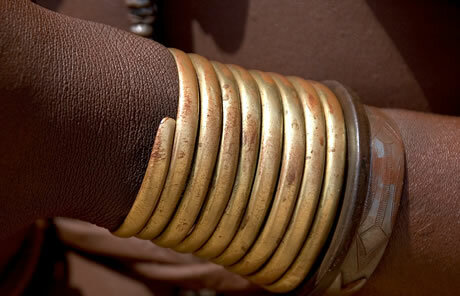 Prices for this itinerary are from £4200 per person fully inclusive of flights, car-hire, meals and certain activities.